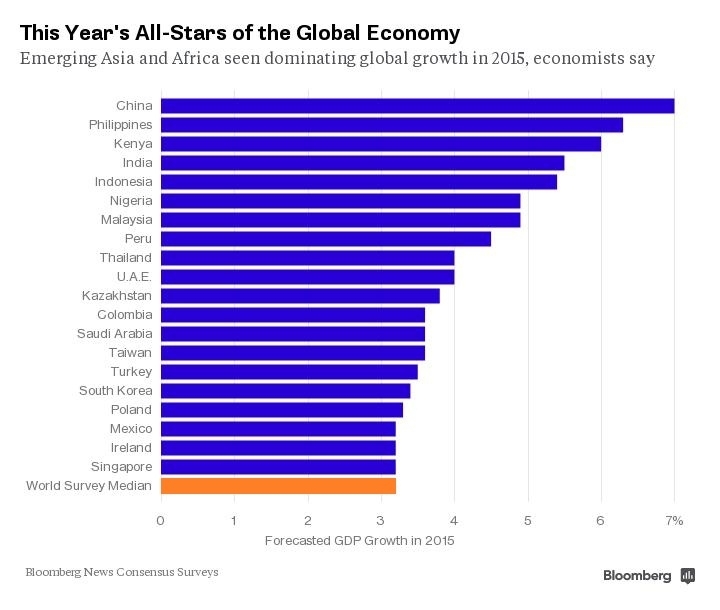 BloombergBusiness reports on the world’s 20 fastest growing economies for 2015. While overall global growth is projected to be 3.2 percent this year, emerging markets in Asia and Africa will grow exceptionally for the next two years. According to a survey conducted by Bloomberg, China, the Philippines, Kenya, and Indonesia together will make up 16 percent of the global gross domestic product. They are all expected to grow more than 5 percent in 2015. By comparison, the US and UK which combined make up about 25 percent of global GDP will grow 3.1 and 2.6 percent respectively. This entry was posted in Africa, Asia, Economics and tagged best international business blog, bloomberg, china, economy, global economy, Michael Czinkota by Michael Czinkota. Bookmark the permalink. Like this site– very easy to navigate and lots to explore! mluxtv Thanks for good article. I read it with big pleasure. I look forward to the next article. Love michaelczinkota.com– extremely informative and lots to think about! Howdy exceptional blog! Does running a blog like this require a great deal of work? I have absolutely no understanding of coding but I was hoping to start my own blog soon. Anyways, if you have any recommendations or tips for new blog owners please share. I know this is off subject nevertheless I simply wanted to ask. Kudos! I’m pleased by the manner in which michaelczinkota.com covers this type of subject matter! Generally to the point, sometimes controversial, always well-written and more often than not quite challenging. Admiring the time and energy you put into your site and detailed information you present. It’s good to come across a blog every once in a while that isn’t the same out of date rehashed material. Fantastic read! I’ve bookmarked your site and I’m adding your RSS feeds to my Google account. Thanks for the noteworthy blog you’ve set up at michaelczinkota.com. Your enthusiasm is absolutely contagious. Thanks again! 10/4/2016 @ 14:37:45 says good work michaelczinkota.com!